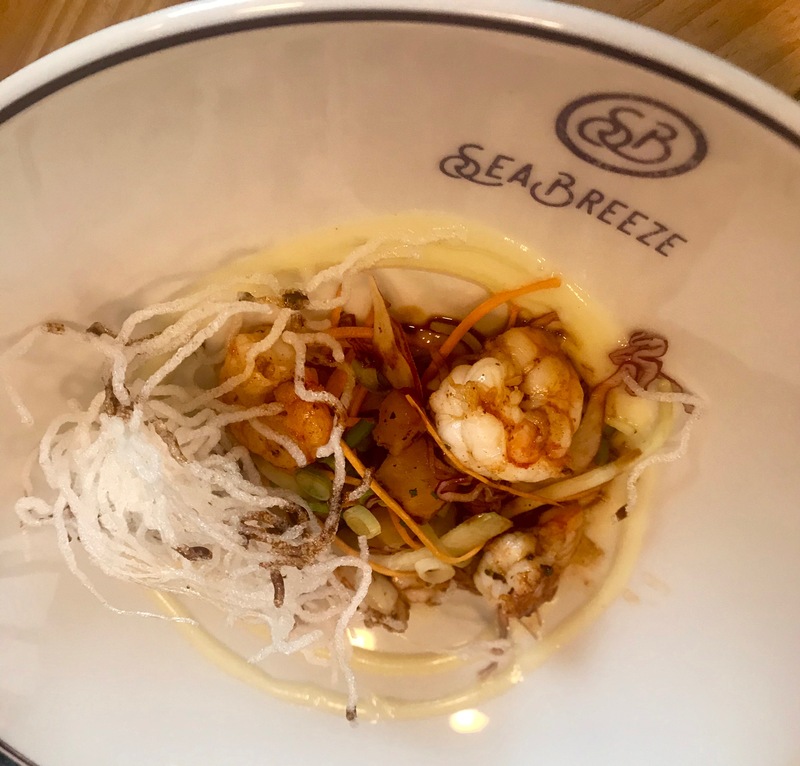 Today we’re heading for lunch at SeaBreeze on Cape Town’s Bree Street. It’s a street on the edge of the City Bowl District (CBD) that I love meandering up and down. It’s home to our favourite pub The Crazy Horse (which sells English bitter to my husband’s delight), and plenty of bars, coffee shops, cafes and restaurants. It seems every year more open, yet none close so there’s even more to chose from. It’s all happening in Bree Street. SeaBreeze Fish & Shell is up towards the mountain end of the street. Always handy when you have something as magnificent as Table Mountain to use as your landmark. 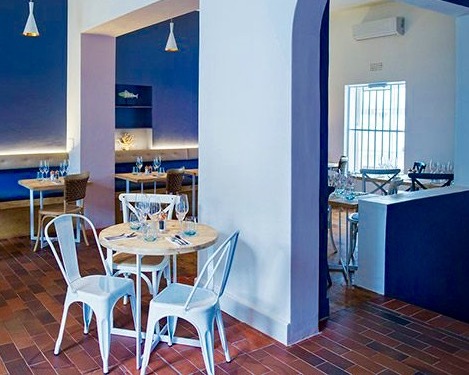 It describes itself as “Celebrating the Mother City’s seafood heritage” – bring it on I say. 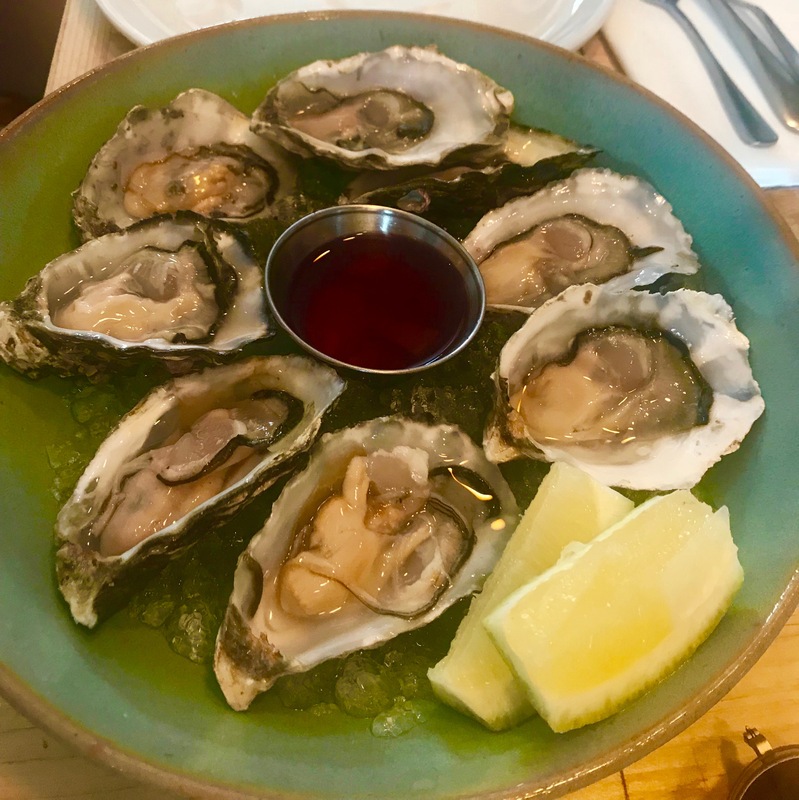 Of course it starts with with oysters. Three kinds in this case – Knysna (from the Garden Route), Saldhana (from the West Coast) and Luderitz (from Namibia). Everyone who loves oysters has their favourites, for me they can’t be too big or too creamy so it’s Knysna every time. They have that perfect just-from-the sea flavour. The grilled prawns came deshelled with red slaw, sesame mayo, chilli nuts and some crispy noodles on the side. The sesame mayo was a wonder, perfect to dip those plump prawns in and add a bit of crunch with nuts and noodles. As we were up for a long lunch we asked if we could finish our starters before we ordered our main courses, our waitress was more than happy to accommodate us. What this did mean is that one of our party liked the prawn starter so much she ordered it again as a main-course portion. Now there’s a good dish! I love fresh tuna but can’t face it if it’s been even slightly overcooked. I don’t know it seems to take most of the flavour out and and also gives it a mushy sort of texture, terrible way to ruin a beautiful piece of fresh tuna. So I was happy to hear the words: “Well done, medium, rare or blue” when asked how I wanted mine cooked. Blue is the answer obviously. And this is what I got. 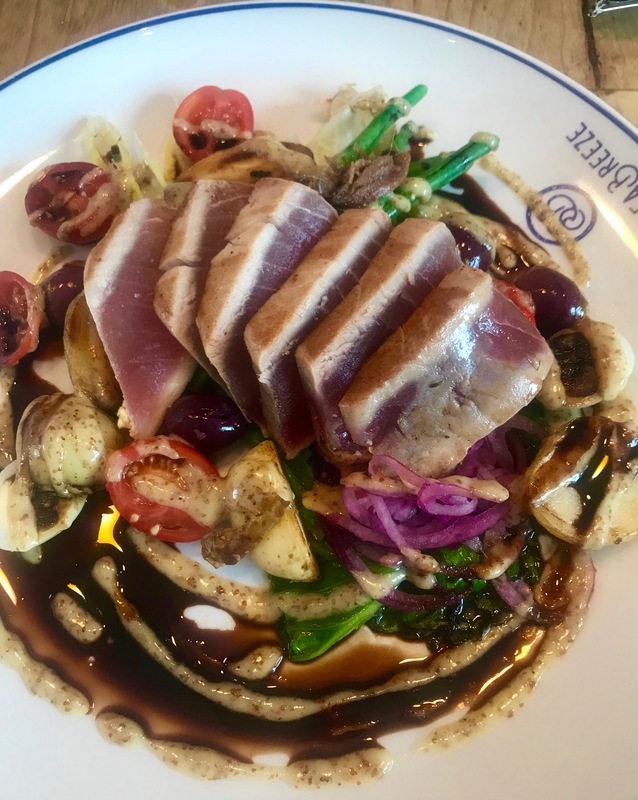 A perfectly seared plate of delicious tuna served with charred cos, anchovies, quails egg and tomatoes. 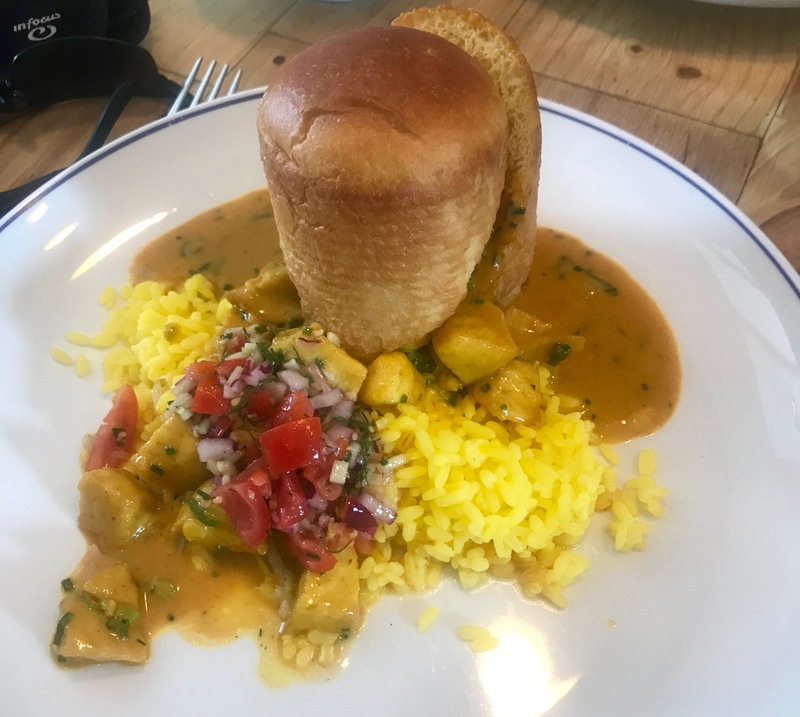 And now for something different – fish bunny chow. 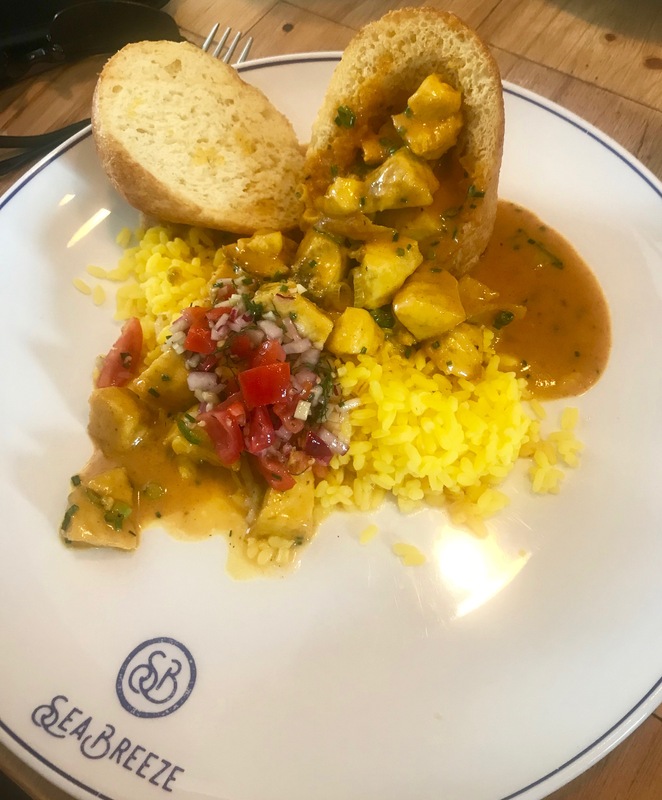 Bunny Chow (or Bunny) was originally a fast food dish of a hollowed out loaf of bread filled with curry that was created in Durban, where there’s a large Indian community, in the 1940s. According to Wikipedia was also sold in Gweru, Zimbabwe during World War II and is still sold in Kadoma, Zimbabwe which is where I was born and grew up. Now there’s a bit of a surprise! Can’t say I saw any of those sort of bunnies around town in my childhood. The bread was beautifully light, kind of brioche-like and the curry was Cape-Malay style, so mild and creamy. A delightful dish, one that makes me want to return purely so I can have one! SeaBreeze has a lovely chilled atmosphere and as befits its name has a seaside feel to it even though you’re not that close to the beach. The menu is all about things from the sea, though there is a steak choice available. 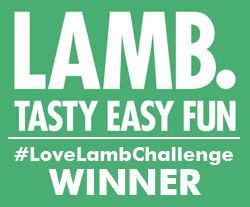 But really you need to go there to celebrate the flavours of Cape Town’s choice seafood. Lunch for two including two starters, two main courses and a bottle of wine comes out at R655 (around £39 at today’s exchange rate). SeaBreeze Fish & Shell is at 211-213 Bree Street.